In the early 60s, Jack Griffith owned a Ford dealership in Plainview, Long Island. He was doing very well, especially when he was allowed to sell the new Shelby Cobras, a vehicle close to Jack's race-enthusiast heart. In fact, Griffith owned one of the factory-prepared Cobras and raced it himself, although not all that successfully. Also on Long Island was a friend of Griffith who was a TVR dealer. TVRs, by all measurement, were not major contenders in the high-performance arena. They were small, just a tubular frame covered with a fiberglass body. Power for the cars came from an 86-hp, 1.6 liter four cylinder engine. This is not to say, however, that the TVRs were slow. They weighed only 1650 pounds and were capable of 0-60 in around 10 seconds, quite sprightly for the era. One day in 1964, Griffith and his TVR-dealer friend got the idea to stuff a Ford 289 V8 into one of the TVRs and see how the car would hold up. They installed the engine successfully and found the car to be very exciting and enjoyable to drive. In fact, Griffith took the "prototype" to Ford to discuss the possibility of providing drivetrains for production versions of the car. Ford accepted the idea (after all, they were providing drivetrains for Shelby and for Sunbeam by this time), as did TVR of England. Bodies and engine/transmission assemblies would be shipped to Griffith on Long Island. The New York Automobile Show of 1964 played host to the first Griffith 200. 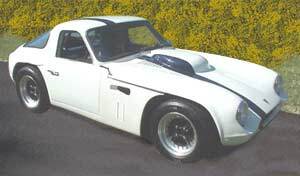 It was almost identical to the standard TVR except for the added hood bulge and dual exhausts. No trunk opening existed on the TVR or Griffith, since the stiffness was required for body integrity. For a price tag of $3995 the Griffith buyer got a 200-hp Ford V8, four-speed Borg Warner T10 transmission, front disc brakes, full instrumentation, roll-up windows and a 0-60 time of 6.9 seconds. Optional equipment offered was the high-performance version of the 289, putting out 271 horsepower. Griffith's advertisement for the high-performance version stated, "You dreamed it....we built it....The Griffith...powered by Ford....0-60 in 3.8 seconds...145 mph!" Griffith Motors produced 203 of the Model 200s and then started building the Model 400, of which only 58 were made. Production was canceled due to a dock strike in late 1965, which devastated Griffith's cash flow. Magazine reviews ranged from enthusiastic to damning about the Griffiths. Some testers were very impressed and found the cars to be relatively easy to handle, although rough riding. Autosport magazine gave the car high marks for stability and acceleration and braking. On the other hand, the Griffith's extremely short wheelbase caused the car to virtually pivot around corners under high speeds, causing loss of the rear end. A number of original owners were killed in the cars, no doubt the result of limited skill, alcohol and an overall failure to keep the tires adhered to the road. That aside, the consistent theme of road tests of the period was one of virtually unlimited power. Inside, the Griffith was spartan in appearance and feel. It was rough riding, cramped, ventilation was limited and the 289's exhaust cooked the passengers. Performance comes at a price. We had the opportunity to drive a Griffith for a day. It was 1966 at the time and the car was brand new, so it was about as fair an evaluation as possible. We had put in a lot of time behind the wheels of Cobras, Corvettes and other very powerful cars, so it was relatively easy to make a fair, "objective" assessment of what is basically a subjective exercise. Of course, that wasn't on our mind in those days. We were just having fun. Our impression of the car — then and now — was that it was loud, flimsy, rattly and very, very, very light. The steering was extremely quick, the brakes "grabby" and the heat nearly unbearable. The seats were uncomfortable and there was no air movement in the car. It was, however, a blast to drive. Acceleration was astounding and each gear had long, long legs — 70 in first, 90 in second, etc. It was "quirky" in its handling and you had to pay attention at all times or you could get in trouble. The potential for disaster was there, all right, but any competent driver was aware of it. The car could quickly reach its limits, however, so one always needed to focus on what was going on. We don't think the Griffith would have sold well in the long run, even had there not been financial failure. It simply couldn't compete in features and luxuries with Corvette, Jaguar and the like, and it was too expensive for the basic sports car market. Besides, it was pretty homely looking. But, boy, what a ride! Today the Griffith is a major collectable. Perhaps it's because of rarity, or maybe because of its out-of-the-mainstream image, but those who want them are willing to pay handsomely for the privilege. Fair-condition (running, reasonably safe to drive) routinely sell for $17,000 and up. Fully-restored versions go in excess of $36,000. TVRs, on the other hand, sell for one-third that amount in equal condition. If you are looking for a Griffith, look very carefully and take someone along who knows the flaws. These cars were constructed in such a way as to trap moisture in the metal frame, causing structural rust. They need to be examined very thoroughly. "I recall some other idiosyncracies of that car! The radiator was low in the nose, so there was no engine mounted fan. The electric fans surprised more than a few people when the car suddenly sounded like it was about to take off! You should recall that, at the time, Chrysler was reputed to have a hundred or so turbine powered cars in real life road tests, and people were listening for that sound. The open nose looked great, but it was a bird sucker. Luckily they couldn't get past the radiator, and would fly out in more or less good condition when the hood/front end was opened. The low ground clearance and limited suspension travel was a problem on northern New Jersey roads of the era. They were mostly oil and gravel, and had more than a few dips and humps. As a result, I pulled the exhaust system off several times. Sounded wonderful, but as there was no place to carry the loose assembly home, a field fix was necessary. That was also a time when gas stations still had attendants, and they washed the windows! It was a challenge to stop them from touching that huge plexiglass rear window. Top speed was in excess of 145, but there wasn't much left at that speed. Still, it would cruise at 120 or 125 all day on an Interstate, and was very comfortable to keep in a straight line at that speed. The problem was torque steer, so as long as I was gentle with the throttle in a turn, no problem. Was it a crazy idea? Yes, but people were stuffing all sorts of things into all sorts of chassis, and it was no surprise. It really was a progression from the works of Healy, Shelby and others, and that 289 block was light, compact and powerful — a natural for the purpose.